As we make the transition away from textbooks as the primary resource for teachers and classrooms, it is understandable that so many people are looking for THE ANSWER which would allow them make this change with as little struggle as possible. Why wouldn't we do this when most of us have been "schooled" to think that there is always one right answer to a question? There is a great comfort in knowing that there is a solution out there just waiting to be found, a solution that we can wrap our heads and hearts around and then settle down with for the next few decades. In Burlington, we started looking for the "next-best thing" a couple of years ago when we hosted our first Digital Publication Collaborative. However, as we provided a space for educators to get together and create we realized that there were multiple options. 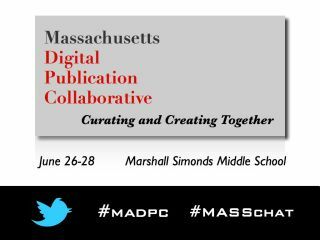 As we move towards our third annual Massachusetts Digital Publication Collaborative in June, we see even more alternatives out there in regards to tools that educators can use to organize content. Our effort is focused on trying to show educators as many of the options out there as possible and letting the educators (who are the learners in this case) make the choice that works best for them. Because in my mind, if we can't get educators to understand the power of "User-Generated Learning" then the choice of a textbook, an iBook, an eBook, or any other resource really doesn't matter. With predictions clear are that our students will enter careers that do not presently exist, we need to ensure that we arm them with the skills to continuously generate their own learning. "Instead of relying on a content area expert or textbook, (learners) are reliable for finding meaningful information." We look forward to bringing learners together again this June!